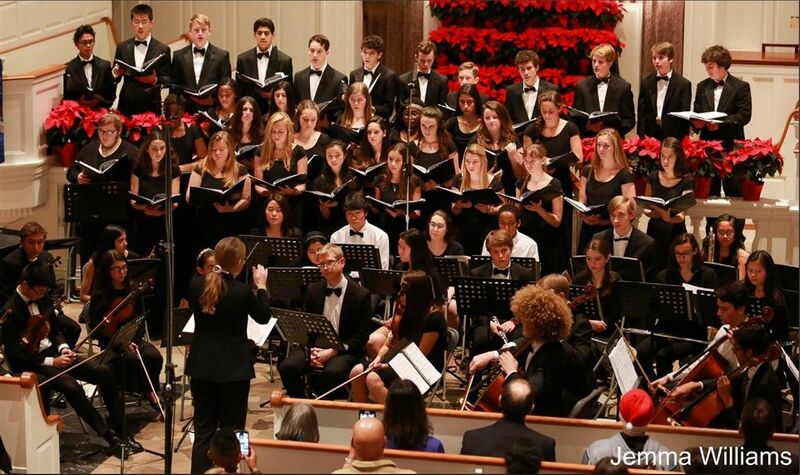 On Tuesday, December 12, the Hopkins Orchestra and Concert Choir gathered at Yale University’s Battell Chapel to perform their annual Winter Concert. Both instrumental groups have worked since September to put together a diverse and spirited set list of songs. The ensembles performed pieces from many countries and time periods. “For the choirs [including the Junior School and 8th grade choir], I chose music from around the world (students sang in Sanskrit, Hebrew, Sotho, Swahili, Yoruba, and Igbo, as well as English and Latin) reflective of the holidays and the quiet of winter, that conveys a message of warmth and peace,” said choral director Erika Schroth. Orchestra conductor and chair of the Art Department Robert Smith also selected songs that reflected multiple centuries and composers. “It’s a tricky thing to do; to find music suitable for an orchestra with a piano and harp. If we choose music that is invigorating, inspirational, and emotional, we can all connect to the songs,” expressed Smith. The orchestra has also grown from previous years, providing both excitements and challenges. “The main idea we’ve been working on is simply listening to each other and watching the conductor in order to stay together. It’s a really important skill that can be incredibly hard for big orchestras to maintain, especially when everyone’s nerves start acting up during the concert,” said Orchestra Concertmaster Alex Zhang ’19. Like the size of the Orchestra and Concert Choir, the audience attending the winter concert has grown as well. This year, the concert was held at Battell Chapel, the location of the Winter Concert three years ago, instead of Church of the Redeemer. While Church of the Redeemer had, “wonderful acoustics,… it’s a little too small for this concert - we had such packed houses the last two years that we knew we needed to find a larger space,” said Schroth. Smith agreed and said, “Battell Chapel is an inspirational building with a splendor of decor fitting for both the holidays and the music we are playing.